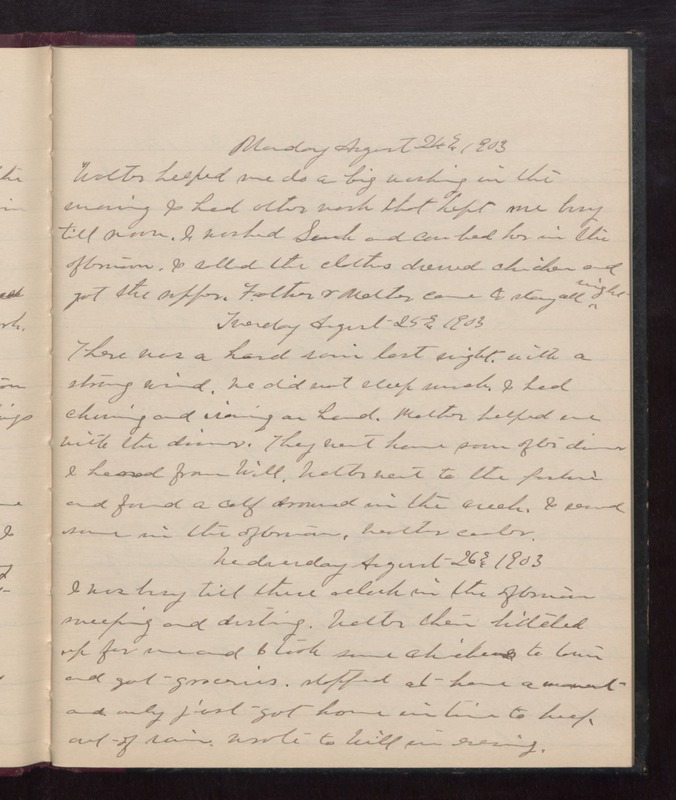 Monday August 24 1903 Walter helped me do a big washing in the morning I had other work that kept me busy till noon. I washed [Sarah?] and [corn?] bed her in the afternoon. I rolled the clothes dress chickens and got the supper. Father & Mother came to stay all night Tuesday August 25th 1893. There was a hard rain last night with a strong wind. We did not sleep much. I had churning and ironing in hand. Mother helped me with the dinner. They went home soon after dinner I heard from Will. Walter went to the pasture and found a calf drowned in the creek. I sewed some in the afternoon. weather cooler. Wednesday August 26th 1903 I was busy till three oclock in the afternoon sweeping and dusting. Walter then hitched up for me and I took some chickens to town and only just got home in time to keep out of rain. Wrote to Will in evening.